Mona Hatoum’s installation A Bigger Splash doesn’t have the fun-and-games look of the David Hockney painting it was named after, unless cannonballing into a blood-red pool of gore is your idea of a good time. Hatoum observed Hockney’s painting of an Los Angeles swimming pool the moment after an unknown swimmer jumped in, which hangs in the Tate, in the years after Lebanon’s Black Saturday left her displaced in London. Black Saturday was not the day a grandma, in pursuit of 75% off crockery, ran over Hatoum at the town mall in her post-Thanksgiving frenzy. Such an encounter might have been preferable to the real Black Saturday in 1975 when the Lebanese airports first closed at the outbreak of the Lebanese Civil War, separating Hatoum from her family and leaving her with little to do in London but attend art school. 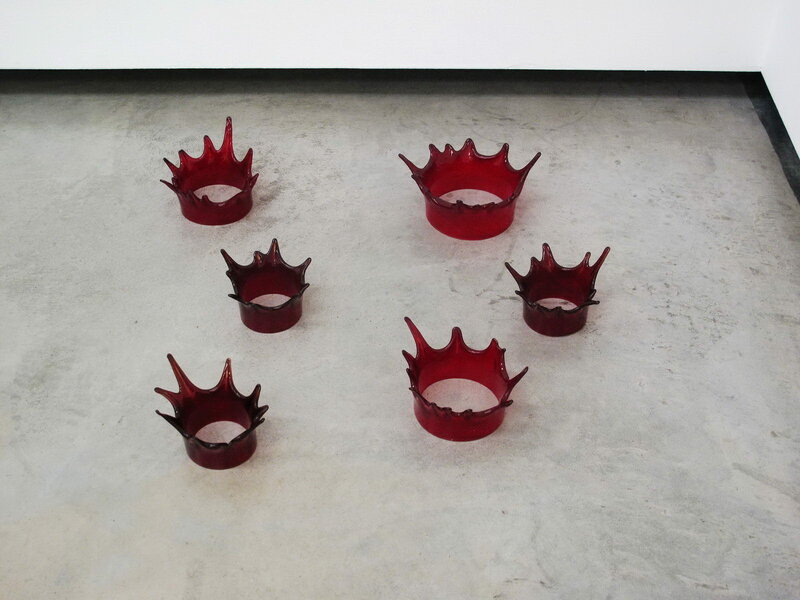 Hatoum’s six crimson Murano-glass splashes are part of her installation collection Interior Landscape, which she exhibited in Venice prior to the current installation at the Museum of Fine Arts in Houston. Considering the other materials she prefers are those such as human hair, nails, and bodily fluids, the vibrant glass from the Murano neighborhood of Venice is a tame medium for Hatoum by comparison. When we remember that she garnered critical acclaim through visual pieces involving images of her mother showering, a video from the camera she had woven through her orifices and over her body, and other endoscopic explorations of herself we can breathe a sigh of relief or frustration--depending on how you like your art--that the closest A Bigger Splash comes to bodily fluids is the blood-red color of the glass structures. Her adaptation and growth as an artist is measurable in her pieces’ absence of an explanation. These splashes could be a commentary on violence, such as the kind that barred her from her family and the country of her birth, or they could emulate Hockney’s idea that freezing a scene--like that of a splash--doesn’t capture the moment but rather allows the moment to evolve into something greater. Regardless of the artistic intent, we viewers won’t be hearing an explanation from Hatoum’s lips. Long gone are her days of encasing herself in a transparent prison, covering herself in mud, and spending hours imitating Sisyphus in her efforts to escape her self-induced imprisonment. No, now Hatoum has drifted away from her political demonstrations and moved to a Minimalist art form. “What I like about Minimalism in particular is the flushing out of all the unnecessary ‘noise’,” said Hatoum. Rather than overwhelm her audiences with a whole song, this installation emanates one clear tone. The beauty of it being that no one can be sure which note they are hearing. Hatoum’s art is inexplicable, exasperating and thought-provoking, but as Topher, the founder of Culture Hog Magazine, once said, “Mona Hatoum works are those giant rubber feet that come down from outer space just to hear the spiders crunch.” It takes a certain level of genius to inspire that kind of incomprehensible praise and Mona Hatoum has it in spades--excuse me, splashes. Antoni, Janine. "Mona Hatoum". BOMB Magazine. N.p., 1997. Web. 6 May 2017. Bertola, Chiara. "Mona Hatoum: Unstable, Living, Organic And Moving Forms". N.p., 2017. Web. 6 May 2017. Cooke, Rachel. "Mona Hatoum: ‘It’s All Luck. I Feel Things Happen Accidentally’". The Guardian. N.p., 17 Apr. 2016. Web. 6 May 2017. Luse, Paula. "“Oh, Mona!”". Arterritory.com. N.p., 17 Nov. 2016. Web. 6 May 2017. "Mona Hatoum: A Bigger Splash". Museum of Fine Arts, Houston. N.p., 2017. Web. 6 May 2017. Parry, James. “Finding the Essence: Mona Hatoum” jamesvperry.com. N.p., 2017. Web. 6 May 2017. Robertson, Emma. "Mona Hatoum: 'It's About Shattering The Familiar'". The Talks. N.p., 19 Oct. 2016. Web. 6 May 2017. Topher. "Mona Hatoum Works That Will Change The World". Culture Hog. N.p., 16 Jan. 2017. Web. 6 May 2017.